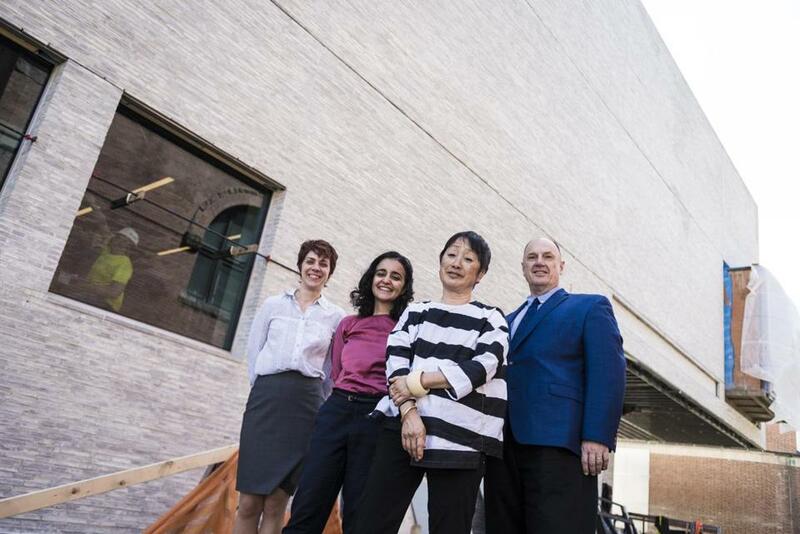 Juliette Bianco, Hood Museum deputy director; Azadeh Rashidi, project architect; Billie Tsien, head architect of renovations; and John Stomberg, Hood director, at the museum during renovations. Late last month, after two years working off campus, the staff of the Hood Museum of Art at Dartmouth College moved into their newly renovated offices on the third floor of the three-story building. Lofty second-floor gallery spaces rise on either side. The $50 million renovation is still underway as construction continues for the museum, which will open to the public on Jan. 26. Stomberg and architect Billie Tsien of Tod Williams Billie Tsien Architects/Partners invited the Globe in for a sneak peak. The design increases the museum’s gallery space by more than 40 percent, to 16,350 square feet, and underlines the Hood’s mission as a teaching museum with new, easily accessible object-based study centers. The architects have made some significant changes to the quirky building originally designed by postmodern architect Charles Moore, which opened in 1985. Among the updates: replacing the north-facing facade and entryway, and separating the attached building from its neighbors. 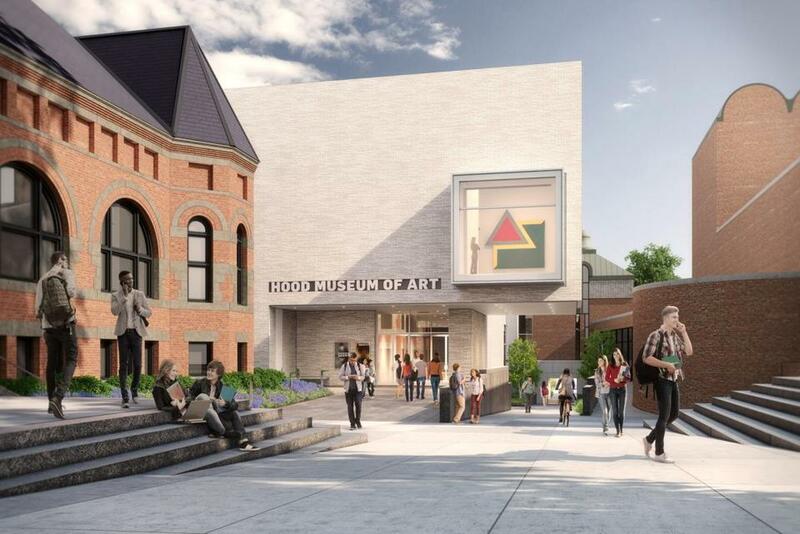 A rendering of the north facade of the Hood Museum of Art at Dartmouth College. The original building, with its many entrances, irregularly shaped galleries, and natural light pouring in along the stairs, felt sui generis. It had its charms and several issues, including the attached buildings, which Dartmouth asked the architects to address. Reviewing Moore’s museum in 1985, Globe architecture critic Robert Campbell called it “a successful and even a marvelous work of architecture that occasionally slackens into self-indulgence and confusion.” He went on to describe the Hood’s gateway across from Dartmouth Green as “grim,” and noted visitors’ confusion once they passed through the gate. “People had a hard time finding the front door,” said Tsien. That’s no longer the case. Williams-Tsien has designed an off-white brick facade with a big bay window looking out toward the Dartmouth Green. Art will be spotlighted there. When the plans were unveiled two years ago, some critics balked. Inside the museum, the window box is an update to Moore’s sunlit staircase. Natural light appeals to visitors, but it can damage art. Williams-Tsien has replaced the stairway windows with light boxes, and their vitrine lets natural light into a gallery designated for sculpture not sensitive to the sun. The new design has widened a walkway beneath the museum connecting the north and south plazas. The southern entry used to be more a back door, but now it sits prominently on the Arts Quad. There are no traces of the new design from this side — it’s all Moore’s mix of romantic gables, playful arcs, and sober red brick. His copper roof and cupola have been faithfully reproduced, but improved to avoid ice dams. Inside, a spacious lobby welcomes visitors to the study center and the galleries. A rendering of a new object-study room at the Hood Museum. Now three classrooms, with enormous doors to accommodate any of the museum’s 65,000 objects, will offer students opportunities to get up close to a Picasso or an Australian aboriginal painting. The architects have maintained Moore’s idiosyncratic exhibition space, and added six new galleries, bringing the total to 16. “In a way, we have simplified [Moore’s design],” says project architect Azadeh Rashidi. Climate control and lighting have been updated; facilities that used to be bulky and exposed are now hidden. Stomberg calls the first gallery beyond the lobby “global contemporary.” The initial installation will include works by May Stevens, Jaune Quick-to-See Smith, Glenn Ligon, and Nigerian painter Obiora Udechukwu. “We’re hoping people will come in and have, excuse the expression, a WTF moment,” says Stomberg. Dartmouth’s collection dates back to 1772, three years after the college was founded, and it includes a trove of ethnographic objects. Bianco says the staff plans to be more nimble with its exhibition planning. “We got really comfortable in the old building with the permanent collection on the first floor, exhibitions on the second,” she says. Now, although galleries will be named for donors, most won’t have specific designations for types of art. The new galleries, like the new north-facing facade, are modern and understated.